Carlee is using Smore newsletters to spread the word online. 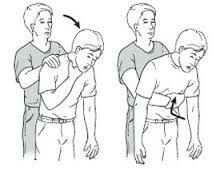 If an adult is choking, it is important to alternate between these two steps. First, bend the person forward at their waist and give 5 blows to their back with the heel of one hand. Then, place your fist in the middle of their abdomen, cover it with the other hand, and pull in and up 5 times. Repeat the process. If the choking adult is unconscious while they are choking, first give them 2 rescue breaths, then 30 chest compressions. After this, look in their throat and see if you can find the object that is blocking the airway, and remove it if you can see it. If not, give two more rescue breaths and continue until they begin to breathe. It is important to give chest compressions hard and fast. You need to compress the chest at least 2 inches. In addition, go at a rate of at least 100 compressions per minute. Give 30 chest compressions, then move onto rescue breaths. 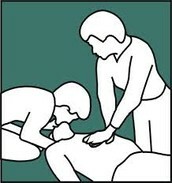 Tilt the victim's head back and life their chin to open up their airway. Pinch their nose shut and make a complete seal over the person's mouth. Blow for about 1 second, so the chest can clearly rise. Then do it once more. It is important to give 2 rescue breaths and then move back to compressions immediately.